Freelancers know how challenging it can be to get paid work and clients in this economy. In order to stand out from the sea of people looking for work, you have to use all available platforms that allow you to showcase your skills and work. Other than creating a website, graphic designers have a number of online portfolio options available to them; however, even though most of these sites allow for social sharing, none of them have the same audience as an actual social media site, like Instagram. An image sharing app and social networking tool, Instagram allows you to take or upload photos or videos, do a little quick photo editing with filters, and then share the results to your followers and the entire Instagram network. You can also easily share the edited image or video on other social sites like Facebook, Flickr and Tumblr (and less easily to Twitter). While Instagram is usually associated with photos, it can be a great platform to display and promote your design work as well. Not only does Instagram have a sizeable audience (as of mid-2012, there were over 80 million registered users), but also its incorporation of hashtags makes finding amazing graphic design very easy. This seems pretty obvious, but can be challenging when you’re putting it into action. Try to find an angle or particular niche that suits your work—you want your passion, ability and personality to show through in your Instagram “portfolio.” People become invested followers and fans when you post images, photos and videos of things that resonate with them. Try telling a story on a piece you’re working on through photos and images, so that others will be compelled to follow up. It’s interesting to many to see the inspiration, the process (as well as the mistakes) and the final result. However, avoid being overly promotional by adding the occasional personal post. People loathe posts and profiles created for the sole purpose of boosting sales or SEO—and these are generally pretty easy to spot. Make sure the posts are organic and reflect genuine passion in your work. As in all social media outlets, frequent publishing will ensure that you stay at the top of a person’s feed (and therefore, top of their mind as well). Start with one photo a day and work up to two to three a day—which should be pretty easy once you get used to documenting various aspects of your professional and personal life. Don’t forget to add important hashtags so that non-followers with similar interests will be able to find you through a search. Interact with other Instagrammers in and outside your network. “Like” other people’s images and photos that you admire. It’s a good idea to periodically like posts on the feeds of the people you follow as it alerts them to the fact that you’re following them—and often liking someone else’s image leads to receiving a like in return. Share your posts on other social media outlets. No social networking site is an island (as much as they might try to be). 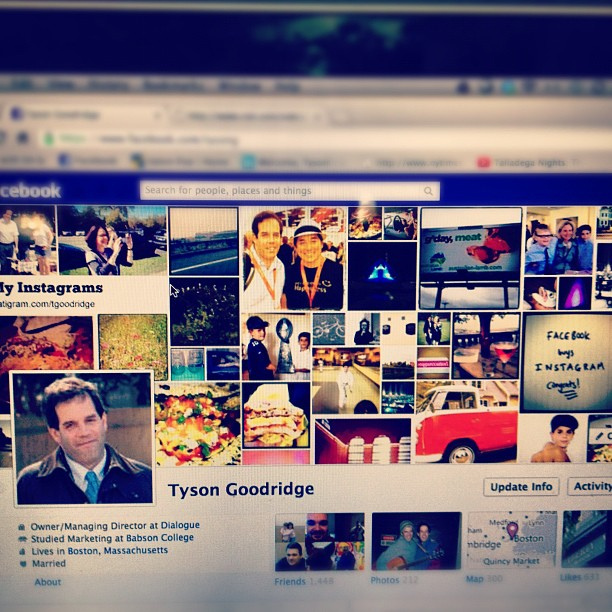 Share your Instagram posts on other social media outlets, like Facebook and Twitter. This maximizes the reach of the image (post once, reach all friends and followers on various sites) and can lead to new followers on Instagram. If your Instagram account is primarily focused on professional achievements and development, or is created as an alternative portfolio, you may want to share your photos and images to a hosted website or blog as more fresh, new content for those sites. A quick way to establish your brand and style, while showcasing your design work, Instagram can be a great supplemental portfolio to gain more work. Additionally, Instagram is also a great place to get design inspiration and network with like-minded people—making it a great social platform to add to your arsenal of professional tools. is a freelance writer and online marketing professional from Southern California. Her speciality lies in search marketing, social networking and content development, and she regularly offers advice to other freelancers hoping to get more exposure for their work.